We really didn’t have the space for another pig, so we found him a home with a great couple with a hobby farm, and they already had a pig, so it sounded perfect. Milo’s family took him to his new home, and he seemed so happy to be outdoors again. The other animals appeared comfortable with his presence. At least at first. Before long, poor Milo was being picked on by the goats, donkey’s and even the other pig. No one wanted anything to do with him, and the poor guy was shutting down. He spent long hours in his stall, away from the animals, and was afraid to venture out. I got a call from his new family, saying they were very worried about him. I offered to come and get him. Milo has been here for a couple of months now, and he seems very happy. However, I think I know why the other animals disliked him. He’s a little pig with a big attitude. He fence fights with everyone, even 800 pound Harry! A fence-fighting pig is a sight to see. They each turn sideways, tails raised high in the air, chomp their teeth and foam at the mouth. Then they begin to march back and forth, in unison, along the fence line, taking occassional bites at the other through the fence. it’s almost like a dance. A war dance. 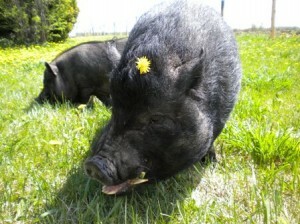 We were hoping Milo could be a friend for Truly, who was a companion to Stormy and Doc, two young farm pigs. Last winter, we thought she might be too cold in the barn, and brought her into the house. In the spring, when we tried to reintigrate her with the boys, it was terrible. Doc tried to attack her every chance he got, and she attacked Stormy, every chance SHE got. So it was just too dangerous, being as she is a small potbelly, and they are two very sturdy farm pigs. It was sad, because they were so close when they were young. They used to snuggle together, the two pink pigs on the outside, and little Truly smushed in the middle. They looked like a reverse Oreo cookie. We tried letting Truly out one day when Milo was out loose. It seemed to be going very well, with each of them ignoring the other. However, my brother in law decided to feed Milo some clover that he had picked, and Truly was incensed, and attacked. It took a minute or two to break them up, but poor Milo was so stressed out, we haven’t tried again. He probably thought, “oh-oh, here we go again.” I am so bad at introducing pigs, as soon as there is a fight, I intervene, which you are really not supposed to do. You’re supposed to let them fight it out, and establish which one is going to be dominant. So for now, Truly remains a house pig, and Milo remains a garage pig. He seems happy enough out there, with time out in the big yard, a couple of hours in the morning, and an hour or so in the evening. He loves coming out to the barn to feed the bigpigs with us. Truly is an excellent house pig. Probably the best ever. She always does her business outside, and she has free run outside. We let her out, and off she goes, travelling every inch of the property. She has never left the property, and comes when we call. Comes running. She’s even taken to taking dips in the pond on hot days. She’s independent on one hand, and a big baby on the other. She loves to be with us. She’ll snuggle with Bob or I in the evening, and she sleeps on the couch at night, where she can tuck herself in under a blanket. In other pig news, we were blessed to be able to find a wonderful home for Angie, a very sheltered, young potbelly from Thunder Bay. Her owner is very ill, and his wonderful, compassionate friend contacted us, hoping we could find a good home for her, before her owner passed away. Angie was picked up just last week, by an amazing lady who drove many, many hours to personally transport her home. She seems to be very comfortable there, and her horizons are expanding every day. I think she is blossoming. Many, many thanks to Marianne, for giving a home to this dear pig. 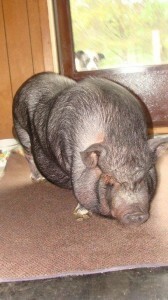 Angie in her old home-in need of a diet! Back in June, Bob and I were pleased to be a part of the first ever Toronto Veggie Pride Parade. It was a fabulous success, and it was great to be marching right down Yonge St. alongside so many others who believed in a compassionate diet, as we do. The parade ended at Yonge/Dundas square, and we were able to meet and mingle with so many wonderful people. We hope to be able to participate again next year. About a month ago, one of our young potbellies, Rebel, got a very bad injury to his shoulder. We’re not sure if it was from Ted the Ripper, who got into their enclosure momentarily, or from Pugsley, the babies surrogate Dad. Pugs would never hurt the babies intentionally, he loves them and is very protective of them, but his sharp tusks could have caused the injury inadvertently. It was a very deep wound, and required 2 weeks of antibiotics to prevent infection, and twice-daily cleanings with saline and a wound salve. Poor Rebel hated this so much. He had to be picked up and restrained, and he hollered mightily, but the wound healed up beautifully. He’s going to have a scar. What is a Rebel without a scar or two though? Puglsey and the babies share a condo in the garage, and spend their days in a huge enclosure in the front of the property. It is so funny leading them out there each morning, with me in the lead, followed by the porocession of pigs. First Pugs, then Domino, with Rebel usually taking up the rear. Rebel usually likes to pause to sneak a few mouthfuls of grass, or scratch himself on the front stairs. They are quite a trio, one of my few successful introductions. Last night Harry, our largest farm pig, decided he was going to camp out in the house Willa’s Dad built for her. This made me quite nervous, as I like to close the barn up at night, but as Harry was being stubborn and would NOT come inside, we had to leave it open, in case he got cold or scared. It’s now almost 8 am, and I’ve just seen Miss Rose venture out of the barn, she’s peeping into the house where Harry is. Rose, Delilah and Willa are 5 year old farm pigs, and none have been spayed, since they all arrived here too old and too large for the surgery. This means, that at any one time, at least one of the girls is in heat. This also means, that poor Harry has to put up with at least one PMS’ing female pretty much all the time. Willa just ignores him, she has been his companion for the longest, and knows he is not equipped to..um..help her. Delilah just gets ornery, and snarks at everyone, mostly Harry. Rose, on the other hand, falls deeply in love with Harry, every 21 days. She follows him non-stop, mooning over him, nudging him with her nose, and singing a very provocative song to him. She actually will sing this song to anyone who will listen, and it’s a sure indicator of when she is cycling. It’s a very deep and fast “UHH UHH UHH UHHH UHH.” The “UHHH’S” coming with both her inhale and exhale. It’s actually quite lovely. I do feel sorry that she has to have this unrequieted love though, all our males are neutered. Poor Rose. On August 21st, there is going to be a Trot-a Thon held in Toronto. It’s organized by a commitee from the Toronto Vegetarian Association, and the proceeds will benefit both the TVA, and 5 local farmed animal sanctuaries, including Ruby Ranch. The link with info is here: http://veg.ca/content/view/954/101/#Details It would be great if you could join us! We also are in the planning stages of a Big Pig Shin-Dig, sometime in September. We’re planning a nice vegan buffet, a garage sale and raffle. More info to come. I do believe I have rambled on long enough, shame on me for not posting more often! The pigs are beginning to stir, and breakfast preparations need to begin. The residents at this hotel for pigs don’t like to be kept waiting!